This incident happened a few weeks ago; on 18th April to be precise. Richard Loitam, a second-semester engineering student of the Acharya NRV School of Architecture died in his bed after a brawl with a couple of hostel mates. To be frank, people have died in fights before too. Male species are born hot-headed and a human body have many vulnerable parts. It’s very easy to kill someone. So to be honest, what shocked me wasn’t the dead of Richard Loitam but the way the school authority treated us North-East people as expendables. The turn of events that happened after his dead was inexcusable. They downright accused the boy to be drug abused and claimed he died due to a head injury in an accident that happened 3 days before. It was all absurd (and later the forensic report also proved them completely wrong!) But worse of all, they didn’t even charged the two men who bashed his head! Richard was not only a good son, he happened to be a talented boy who loved to play sports. His photos were over the internet showing him taking part in various extra-curricular activities during High School like playing music, dancing traditional style... It was absolutely demeaning to try and tarnish his image by saying he was a drug user. The school authority tried to stereotype the NE. It boiled my blood. What rights do they have to treat the parents who lost a young son to such torture? It was really insulting and unjust. A few days later, this news spread like wild fire. A fire ignited by a young Manipuri lady Monika Khangembam who felt very strongly about the incident. She posted in Facebook about the whole situation. 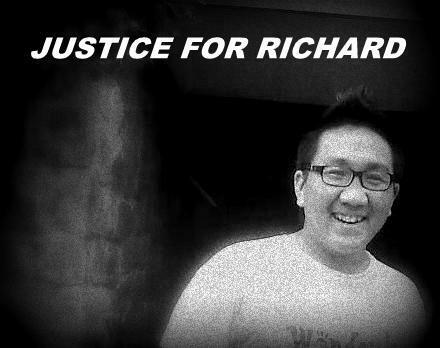 A lot of people who doesn’t even had a clue who Richard was, saw the updates and now feel the pain and injustice of the whole situation. In just a day, the Facebook page “Justice for Loitam Richard” got about 5000 members. The movement just begun! A supposedly relative of Richard posted a highly disturbing blood stained corpse of Loitam at the page. The picture showed a heavily swollen head with bruises all over. It was quite evident that poor Richard bled to death. When i first saw that horrible pic, i nearly vomited and felt immense anger! I guess it invoked a reaction to everyone else too ‘coz that was when a chain reaction started. The member of the page reached 1lakh overnight and kept on increasing steadily. As of right now there are 2,11,352 members with angry opinions and arguments about racism. On 29th April there was a sit in protest at Town Hall, Bangalore. Thousands of people from all walks of life came to attend the Solidarity meeting. At the same time there was also sit in protest at Manipur, Delhi and Gwalior. The media picked up the story. Debate about how North-East Indian people are often discriminated and how unwelcomed they felt were highlighted in many News channel. I have seen this kinda movement for Justice only on TV and movies. However this time it was real. Lotsa supports came from people all over India. Manipuri people finally united in this one big campaign. The case was given high priority and the government finally put pressure to the investigation. On 2nd May it was reported that the two students who killed Richard are being booked and will hopefully be arrested & punished once the full Forensic report comes. The college suffered a very bad name. Charges against the management could be filed too. The fight is half over. Now all those sneaky bastards know that crime have consequences. Richard Loitam didn’t die in vain. Somehow his dead showed that there is still humanity left on Earth. And we will continue to fight for his justice!! You can now R.I.P. brother. They hurt me today, Mom. And the night is getting cold. The wall screamed my pain. And now I lay all alone. Wish you were here, Dad. I miss you real bad. And see you both once more. Let me close my eyes. He’ll never wake up alive. This is a very sad story. I had no idea that this happened, and it angers me. I love your poem. Thank you for sharing it. Thanks for stopping by Michael ! Ya Ankit, I hope u're right about the justice part. And thanks! I wrote the poem with emotions too.